A hill is a landform that extends above the surrounding terrain. It often has a distinct summit, although in areas with scarp/dip topography a hill may refer to a particular section of flat terrain without a massive summit. A dissected plateau is a plateau area that has been severely eroded so that the relief is sharp. Such an area may be referred to as mountainous, but dissected plateaus are distinguishable from orogenic mountain belts by the lack of folding, metamorphism, extensive faulting, or magmatic activity that accompanies orogeny. Wikimedia Commons has media related to Ridges . 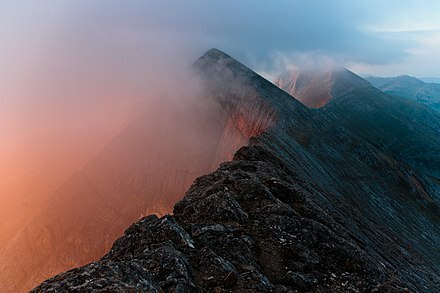 A mountain chain is a row of high mountain summits, a linear sequence of interconnected or related mountains, or a contiguous ridge of mountains within a larger mountain range. 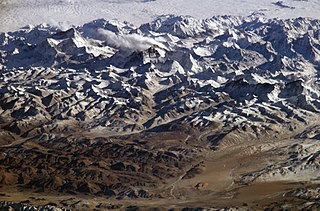 The term is also used for elongated fold mountains with several parallel chains. Olympus Mons is a very large shield volcano on the planet Mars. The volcano has a height of nearly 25 km as measured by the Mars Orbiter Laser Altimeter (MOLA). Olympus Mons is about two and a half times Mount Everest's height above sea level. It is the largest volcano, the tallest planetary mountain, and the second tallest mountain currently discovered in the Solar System compared to Rheasilvia on Vesta. It is the youngest of the large volcanoes on Mars, having formed during Mars's Hesperian Period. It had been known to astronomers since the late 19th century as the albedo feature Nix Olympica. Its mountainous nature was suspected well before space probes confirmed its identity as a mountain. The Mono–Inyo Craters are a volcanic chain of craters, domes and lava flows in Mono County, Eastern California. The chain stretches 25 miles (40 km) from the northwest shore of Mono Lake to the south of Mammoth Mountain. The Mono Lake Volcanic Field forms the northernmost part of the chain and consists of two volcanic islands in the lake and one cinder cone volcano on its northwest shore. Most of the Mono Craters, which make up the bulk of the northern part of the Mono–Inyo chain, are phreatic volcanoes that have since been either plugged or over-topped by rhyolite domes and lava flows. The Inyo Craters form much of the southern part of the chain and consist of phreatic explosion pits, and rhyolitic lava flows and domes. The southernmost part of the chain consists of fumaroles and explosion pits on Mammoth Mountain and a set of cinder cones south of the mountain; the latter are called the Red Cones. The geology of the Lassen volcanic area presents a record of sedimentation and volcanic activity in the area in and around Lassen Volcanic National Park in Northern California, U.S. The park is located in the southernmost part of the Cascade Mountain Range in the Pacific Northwest region of the United States. Pacific Oceanic tectonic plates have plunged below the North American Plate in this part of North America for hundreds of millions of years. Heat from these subducting plates has fed scores of volcanoes in California, Oregon, Washington and British Columbia over at least the past 30 million years and is also responsible for activities in the Lassen volcanic area. The Garibaldi Volcanic Belt is a northwest-southeast trending volcanic chain in the Pacific Ranges of the Coast Mountains that extends from Watts Point in the south to the Ha-Iltzuk Icefield in the north. This chain of volcanoes is located in southwestern British Columbia, Canada. It forms the northernmost segment of the Cascade Volcanic Arc, which includes Mount St. Helens and Mount Baker. 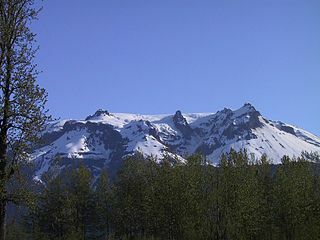 Most volcanoes of the Garibaldi chain are dormant stratovolcanoes and subglacial volcanoes that have been eroded by glacial ice. Less common volcanic landforms include cinder cones, volcanic plugs, lava domes and calderas. These diverse formations were created by different styles of volcanic activity, including Peléan and Plinian eruptions. Alba Mons is an immense, low-lying volcano located in the northern Tharsis region of the planet Mars. It is the largest volcano on Mars in terms of area, with volcanic flow fields that extend for at least 1,350 km (840 mi) from its summit. Although the volcano has a span comparable to that of the United States, it reaches an elevation of only 6.8 km (22,000 ft) at its highest point. This is about one-third the height of Olympus Mons, the tallest volcano on the planet. The flanks of Alba Mons have very gentle slopes. The average slope along the volcano's northern flank is 0.5°, which is over five times lower than the slopes on the other large Tharsis volcanoes. In broad profile, Alba Mons resembles a vast but barely raised welt on the planet's surface. It is a unique volcanic structure with no counterpart on Earth or elsewhere on Mars. The Oak Ridges Moraine is a geological landform that runs east-west across south central Ontario, Canada. It developed about 12,000 years ago, during the Wisconsin glaciation in North America. A complex ridge of sedimentary material, the moraine is known to have partially developed under water. The Niagara Escarpment played a key role in forming the moraine in that it acted as a dam for glacial meltwater trapped between it and two ice lobes. Hoodoo Mountain is a potentially active flat-topped stratovolcano in the Stikine Country of northwestern British Columbia, Canada, located 74 km (46 mi) northeast of Wrangell, Alaska, on the north side of the lower Iskut River and 30 km (19 mi) east of its junction with the Stikine River. It is situated in the Boundary Ranges of the Coast Mountains and existed since the Late Pleistocene stage of the Pleistocene epoch, which began 130,000 years ago and ended 10,000 years ago. Mount Fee is a volcanic peak in the Pacific Ranges of the Coast Mountains in southwestern British Columbia, Canada. It is located 13 km (8.1 mi) south of Callaghan Lake and 21 km (13 mi) west of the resort town of Whistler. With a summit elevation of 2,162 m (7,093 ft) and a topographic prominence of 312 m (1,024 ft), it rises above the surrounding rugged landscape on an alpine mountain ridge. This mountain ridge represents the base of a north-south trending volcanic field which Mount Fee occupies. Tempe Terra is a heavily cratered highland region in the northern hemisphere of the planet Mars. Located at the northeastern edge of the Tharsis volcanic province, Tempe Terra is notable for its high degree of crustal fracturing and deformation. The region also contains a large number of small shield volcanoes, lava flows, and other volcanic structures. 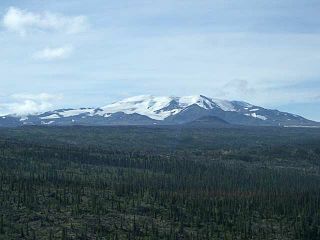 Volcanology of Canada includes lava flows, lava plateaus, lava domes, cinder cones, stratovolcanoes, shield volcanoes, submarine volcanoes, calderas, diatremes, and maars, along with examples of more less common volcanic forms such as tuyas and subglacial mounds. It has a very complex volcanological history spanning from the Precambrian eon at least 3.11 billion years ago when this part of the North American continent began to form. Sollipulli is an ice-filled volcanic caldera and volcanic complex, which lies southeast of the small town of Melipeuco in the La Araucanía Region, Chile. It is part of the Southern Volcanic Zone of the Andes, one of the four volcanic belts in the Andes chain. 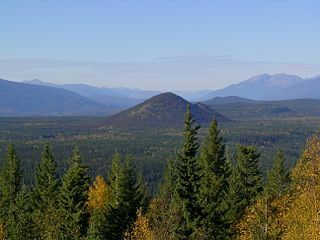 The Wells Gray-Clearwater volcanic field, also called the Clearwater Cone Group, is a potentially active monogenetic volcanic field in east-central British Columbia, Canada, located approximately 130 km (81 mi) north of Kamloops. It is situated in the Cariboo Mountains of the Columbia Mountains and on the Quesnel and Shuswap Highlands. As a monogenetic volcanic field, it is a place with numerous small basaltic volcanoes and extensive lava flows. The Mount Cayley volcanic field is a remote volcanic zone on the South Coast of British Columbia, Canada, stretching 31 km (19 mi) from the Pemberton Icefield to the Squamish River. It forms a segment of the Garibaldi Volcanic Belt, the Canadian portion of the Cascade Volcanic Arc, which extends from Northern California to southwestern British Columbia. Most of the Cayley volcanoes were formed during periods of volcanism under sheets of glacial ice throughout the last glacial period. These subglacial eruptions formed steep, flat-topped volcanoes and subglacial lava domes, most of which have been entirely exposed by deglaciation. However, at least two volcanoes predate the last glacial period and both are highly eroded. 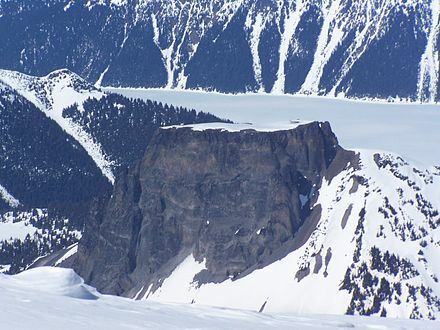 The field gets its name from Mount Cayley, the largest and most persistent volcano, located at the southern end of the Powder Mountain Icefield. This icefield covers much of the central portion of the volcanic field and is one of the several glacial fields in the Pacific Ranges of the Coast Mountains. The surface of Venus is dominated by geologic features that include volcanoes, large impact craters, and aeolian erosion and sedimentation landforms. Venus has a topography reflecting its single, strong crustal plate, with a unimodal elevation distribution that preserves geologic structures for long periods of time. Studies of the Venusian surface are based on imaging, radar, and altimetry data collected from several exploratory space probes, particularly Magellan, since 1961. Despite its similarities to Earth in size, mass, density, and possibly composition, Venus has a unique geology that is unlike Earth's. Although much older than Earth's, the surface of Venus is relatively young compared to other terrestrial planets, possibly due to a global-scale resurfacing event that buried much of the previous rock record. Venus is believed to have approximately the same bulk elemental composition as Earth, due to the physical similarities, but the exact composition is unknown. The surface conditions on Venus are more extreme than on Earth, with temperatures ranging from 453 to 473 °C and pressures of 95 bar. Venus lacks water, which makes crustal rock stronger and helps preserve surface features. The features observed provide evidence for the geological processes at work. Twenty feature types have been categorized thus far. These classes include local features, such as craters, coronae, and undae, as well as regional-scale features, such as planitiae, plana, and tesserae. ↑ "How Volcanoes Work - lava flow features". www.geology.sdsu.edu. Retrieved 2019-01-13.